April 22, 2011, 7:30–11:00 p.m. The USC School of Cinematic Arts and Visions and Voices: The USC Arts & Humanities Initiative invite you to experience a live visual music sensation on Friday, April 22nd! 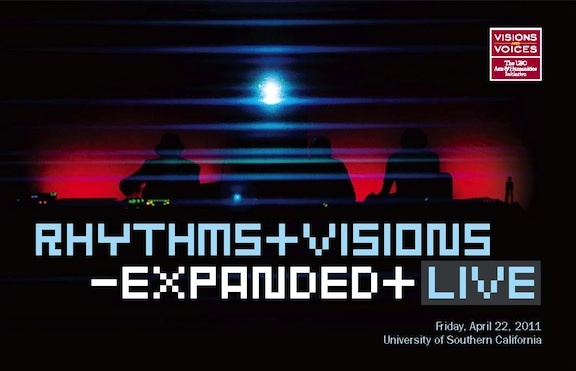 The School of Cinematic Arts Complex will be taken over and transformed by Rhythms and Visions: Expanded and Live! a spectacular outdoor live-cinema event merging animation and visual media with live acoustic and electronic music. Exciting and innovative UK audio-visual collective D-Fuse and Los Angeles artist Scott Pagano will perform to music by notable musicians Brian King, Trifonic, Brian LeBarton and MB Gordy. These cutting-edge performances will span animation, experimental documentary and abstract visual music. The School of Cinema Arts complex will come alive with large animation and 3-D stereoscopic projections by faculty and students. 3-D glasses will be provided. Come to a day of hands-on VJ Workshops with D-Fuse and members of the LA-VA Los Angeles Video Artists. Learn about Visual Music, the best VJ software and more. Rhythms and Visions: Expanded and Live! is presented by Visions and Voices: The USC Arts & Humanities Initiative. Organized by Mike Patterson (Animation), Candace Reckinger (Animation), Eric Hanson (Animation), Brian King (Scoring for Motion Pictures and Television) and Perry Hoberman (Cinematic Arts).